ATMs are available in many parts of Muscat - ensure you inform your bank before travelling abroad, and be aware you may be charged for cash withdrawals. It is advisable to exchange some cash before arriving in Muscat. Visit the other Muscat city guide sections to get more detailed travel advice, and information on the best Muscat attractions and sightseeing activities, recommended shops and restaurants, as well as the best Muscat hotels. Muscatâ€™s currency is the Rial Omani (RO), which is difficult to change outside of the country. One RO is divided into 1000 biazas. You will find coins worth 5, 20, 25, and 50 baizas, and notes worth 1, 5, 10, 20, and 50 ROs. To compare, one US dollar is worth 0.380 Rial Omani. Visitors from foreign countries will have no trouble exchanging their money when they get into Oman. Before leaving, however, guests should change any remaining Rial Omani back into their currency. There are money changers throughout the city and several banks which will provide currency exchange at rates comparable to the money changers. 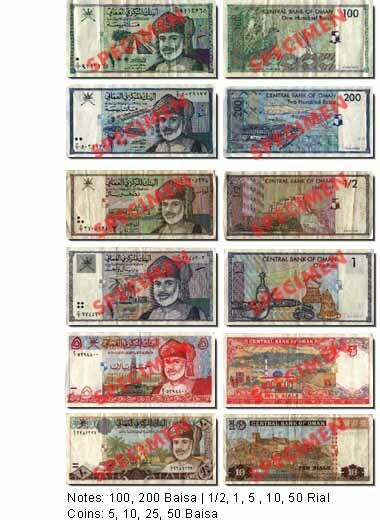 The following is a list of money changers located in the city of Muscat. They are typically open Saturday through Thursday 8:00am to 1:00pm. Plan on exchanging your money early in the day because you may not get a chance to after siesta! It is often advised the visitors not carry large amounts of cash with them as it could become lost or stolen. Instead of seeing your vacation budget gone with the wind, use your ATM or debit card instead. Withdrawing only a small amount of necessary money will allow much more security. If your card should become lost or stolen, you simply report it and are not liable for any fraudulent charges (check with your bank concerning their policy on this). You will find most banks in the Central Business District in Ruwi. Bank Muscat is the largest in the country, so visitors will find plenty of branches and ATMs throughout the city. You can get cash advances on credit cards or travellersâ€™ checks, though be wary of this. There are often large commissions â€“ not to mention fees from your credit card company. Like any modern city, there are ATMs to be found on nearly every street, and certainly in places frequented by tourists, such as shopping centers, hotels, and near many attractions. Banks are typically open Saturday through Wednesday from 8:00am to 1:00. The Omani weekend is Thursday and Friday. Before you leave for your Muscat vacation, check the symbols on the back of your ATM or bank card. If it has either the Cirrus or Plus logos, then it should be almost universally accepted. Cirrus and Plus are global banking networks; when you arrive in Muscat, simply find ATMS with the logo, and you can withdraw your funds. Anyone who uses ATM cards knows that there are often fees attached if you withdraw from another bank. Consider this when you use an ATM. There are often fees that originate with the bank you are withdrawing from, your bank, and perhaps a foreign transaction fee. ATMs are convenient, but if you need only a small amount of cash, check to see if a local store will give you cash back on a small purchase. You can avoid the fee while getting a few necessities at the grocery or convenience store. Credit cards are also widely accepted, and both American Express and HSBC have branch officies in Muscat should you need assistance.